← Currency trading and Gambling: Five Reasons They Are not the same. he US Dollar (ticker: USDOLLAR) matched its largest single-week advance since July as financial market uncertainty and a 2 percent drop in the US S&P 500 boosted demand for the safe-haven currency. 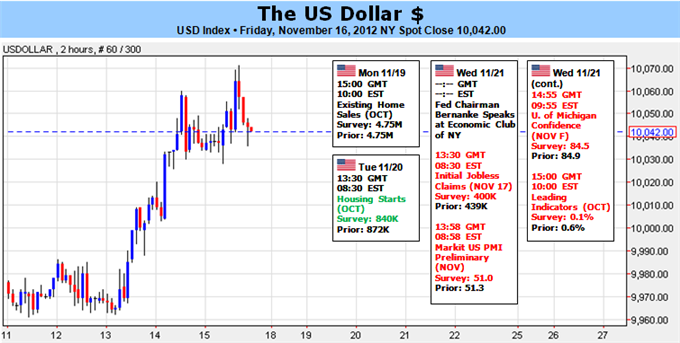 A disappointing week for risky assets sets the stage for further US Dollar strength—especially as we see uncertainty surrounding the so-called Fiscal Cliff negotiations and renewed arm conflict in Israel and the Gaza Strip weigh on sentiment. Earlier hints that the US Federal Reserve would enact further Quantitative Easing initially sent the Greenback lower. Yet even the prospect of further monetary policy easing was not enough to offset a renewed wave of pessimism as the S&P finished near multi-month lows. A holiday-shortened trading week ahead offers relatively little in terms of foreseeable economic event risk, but that doesn’t rule out Dollar volatility through the days ahead. We’ll pay particularly close attention to Fed Chairman Ben Bernanke’s Tuesday address at the Economic Club in New York—that which will give further clues on the Fed’s next steps for monetary policy. The recently-released minutes from the Federal Open Market Committee’s October decision made it fairly clear that officials were likely to enact further easing at next month’s meeting. The expiration of “Operation Twist” comes at a time when FOMC officials likely believe they should be doing more—not less—to boost the sagging labor market and broader economy. Indeed, officials showed little fear over price pressures despite open-ended Quantitative Easing measures and a slightly above-forecast Consumer Price Index inflation number for October. Yet markets proved ultimately unimpressed at the prospect of further QE, and the combination of worries over the US Fiscal Cliff and escalating violence in Israel and the Gaza strip pushed US stock markets to their lowest levels in months. Now past the highly-anticipated US Presidential elections, politicians once again take center-stage as the threat of sizeable tax increases and spending cuts threatens to pull the US back into recession through early 2013. The facts remain clear: if nothing is done, the combination of tax increases and spending cuts could cost the United States up to 4 percentage points in GDP growth in the New Year. Given that the damage would essentially be self-inflicted, one would assume that the US Congress and President would seek a resolution as quickly as possible. Yet the Democratic party controls the presidency and Senate while the Republicans control the house; there must be compromise between parties to get a deal done. Early rhetoric from Republican and Democratic leaders suggests this round could be different than the last. But it may take nothing short of a miracle for a breakthrough to occur before the soft deadline of January, 2013. Expect to hear the term “Fiscal Cliff” frequently in the next two months as financial markets grapple with this fairly significant risk to the global economy. And though we won’t get clarity on a potential deal for some time, be mindful of volatility when President Obama or House of Representatives Speaker Boehner speak on the status of negotiations. We could be in for more uncertainty and dour sentiment across the S&P 500 and broader risky asset classes. Clear deterioration in armed conflict between Israel and the Gaza Strip could likewise keep a lid on optimism and further benefit the safe-haven US Dollar.